Dedicated to Jillian for giving me the idea to write this article. Thank you. Image taken from Imgur years ago. Socializing is hard enough when you are a healthy, human being. You could be shy or nervous to talk to others. 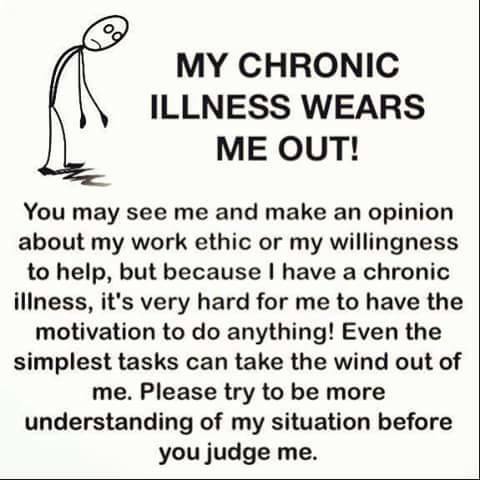 However, with a chronic, invisible illness, it's even harder. 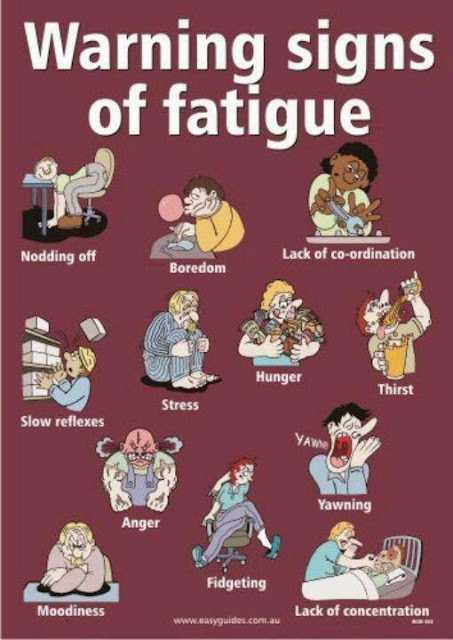 Imagine having that nervousness and shyness leading to vomiting, intestinal spasms, bloating, and many other things but the main culprit is fatigue. 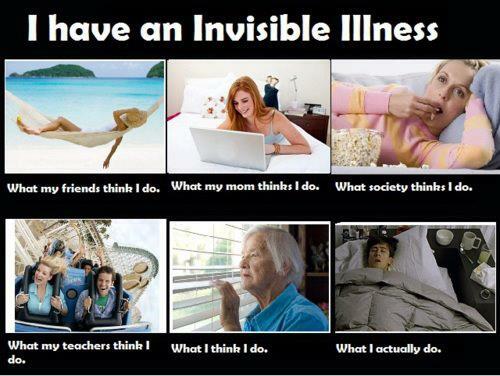 So, what are some activities that you can do when you have a chronic invisible illness? Personally, what I like to do is to invite my friends over for a board game night or for a movie night. We can have themed movie nights, like a Nicholas Cage movie night where we all sit around and riff the movies, or a serious movie night, watching a recently released movie on Blu-Ray. My friends and I really love board games, and I have a cabinet full. Usually, though, we will find ourselves in a game of Cards Against Humanity. If my friends cannot come over, I may call one of them on Skype or Hangouts and watch a movie with a person that way (we would be watching it at the same time at our respective houses) and talk to each other through the computer. I vomit with my Gastroparesis, so I am always conscious enough to ask my guests if vomiting will make them vomit. I really don't want to start a vomiting conga line in my house. If I get a yes to this question, I still have my Emesis Bags handy, but will try to run to the bathroom, if I can. Some people are really sensitive to others getting sick, so I'm always sure to double check. I might order them food or have snacks ready for them when they come over, but I can not partake. I usually just sip on a soda during the game or movie. I recognized my limitations early on. I cannot go out to restaurants, hike like I used to, go to movies, go bowling, etc. I consider that chapter in my life closed when it comes to socialization in a setting like that. I have to be creative and come up with new ways to socialize because of my vomiting and Gastroparesis. It doesn't mean that I cannot socialize, it is just that I can no longer socialize in those ways. I know that not everyone with Gastroparesis vomits, so individually, you have to recognize what your limitations are in order to work with them, and not against them, so you do not make yourself even more sick. 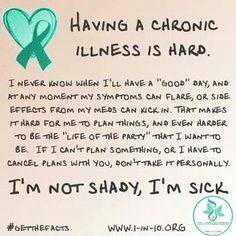 If I am having a good Gastroparesis day, then I usually play on my Xbox One, logging into the internet, and play with other people in my game. I can socialize with those people because I have a headset for gaming that has a microphone, which is my way of reaching others in the game, and depending on the game being played, being able to plan a coordinated attack. This also helps me deal with pent up aggression and negative feelings, because I can take it out on killing zombies in my game. That sounds hideous written down, but it really does help me. Additionally, playing the game with other people online helps me to build new friendships and to be able to talk to others. It's a nice escape from watching Netflix all day. Plus, I get to meet new people and maybe even learn new things about the game I'm playing that I did not know before. Image taken from Imgur three years ago. Coloring has been a good stress relief for me. I have always loved to color. There are a lot of different coloring groups on Facebook now, as well as websites, Facebook pages, and blogs. You could challenge your friends to a coloring contest and compare each other's work on Skype or Google Hangouts (if you cannot leave your house and if they cannot come over), and have someone predesignated as the judge. You could do those competitions for fun or maybe real prizes if you are feeling confident. You could have your friends come over and you could all color together. It's an activity that is easy, stress relieving, and is fun for everyone involved. I mentioned this above because it is something my friends and I like to do. You can have your friends over for a movie night, or if you are feeling well enough, you can go to a friend's house for a movie night. It can be themed or not. It is all up to you. You can be just as creative as you want to be with it. I mentioned above we had a Nicolas Cage night because we like to make fun of some of his bad movies, in our personal opinions, and we love to watch his better movies. My friends and I have a tradition of having a scary movie themed night once every weekend in October. I love to have serious movie nights of movies just released on Blu-Ray that I haven't seen yet, and I love to re-watch favorites. Sometimes, my friends and I (even my husband and I will do this) download Rifftrax (which are the guys who did Mystery Science Theatre 3000) and listen to Rifftrax accompany the movie we are watching. It is a ton of fun and sometimes, I have issues trying not to stop laughing. My friends and I also had our own riffs to accompany the movie. This way, I can stay at home, but still be social. I mentioned above that my friends and I like to play Cards Against Humanity and board games. I have a china cabinet stacked with board games because I am a board game collector. I will say that I think my favorite game is Cards Against Humanity because it is SO funny! I always make anyone new playing the game to make their own card for my deck. However, if Cards Against Humanity is too dirty for you, an alternative is Apples to Apples, which is just as funny. My friends like to play Catan. I am not so crazy about that board game because it reminds me a bit of Monopoly, and leads to arguments. I love games like Trivial Pursuit. It all depends on your tastes and your friends' tastes on what board games or card games you play, but it's still a fun way to socialize when you cannot leave your house. With board games and card games, there are just so many options to choose from, so boredom is never an option. If you knit or crochet, you could ask your friends to come over and do that activity together while listening to music or the TV. I love to knit but I do not knit traditionally. 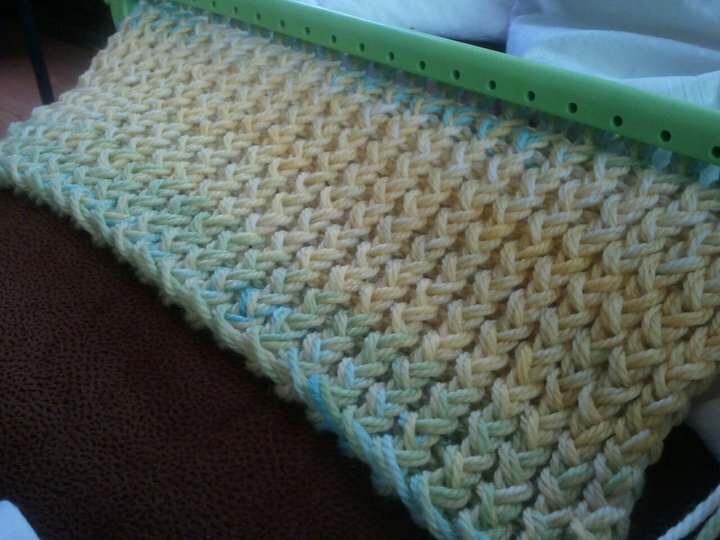 I use a Knifty Knitter where I wrap the yarn around pegs and then pull them through. I mostly make scarves. It isn't hard to learn or do. 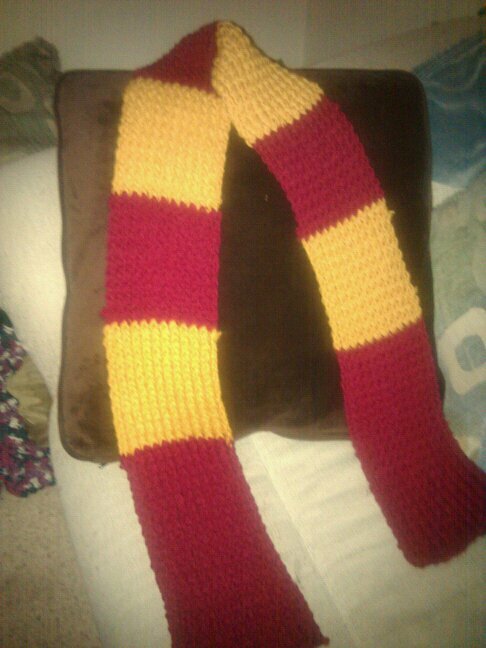 I can make a scarf in three days, if I put my mind to it. I can do it while watching TV or just sitting around the house. It gives me something to do. This is definitely something you can do with your friends or if you want to do it on your own, that is fine too. There are lots of Youtube videos to teach you how to use the knifty knitter, as well as showing you different stitches, and different patterns you can do. Yarn for projects like this is also fairly cheap. I get the thicker yarns if I am making a scarf, and a counter to press if I want to make the scarf multi-colored. I have friends who have knitting circles. It is a very relaxing hobby. Scarves that I have made for friends. I made my husband a Gryffindor scarf from Harry Potter. Image Source on the image. My friend Denise loved to make cards. She would make homemade cards and send them out to people. My mother makes jewelry. If a lot of your friends do arts and crafts, and you have no knowledge of how they do their projects, invite them over and have them teach you. Additionally, you may be able to teach your friends some of the arts and crafts that you do in your spare time. You could found an arts and crafts circle that meets once a week. That might help with socialization and also help keep you occupied during the week so that you do not dwell on your stomach or pain. There are several groups on Facebook, Pinterest, Yahoo Groups, and Google Plus dedicated to arts and crafts. It might be nice to have the ability to learn something new, something you did not know before might be something you really like and take up as your own hobby. You and your friends could develop a schedule of meet ups and then present what you have finished and/or ask for help with projects. You could call your friends and set up a date and time for them to sleep over. You can be as creative with this as you want to, from putting tents up in your backyard to turning your living room floor in pillows and sheets. You can gossip with your friends and get caught up on what has been happening while you are at home and just spend some quality time with you friends. This way, you do not have any stress put upon you because you are not in public, and you do not have to worry about finding a bathroom. It helps you catch up and still be active in your friends' lives, even though you are at home. I started a group like this on Facebook Books, TV, and Movie Club where you can assign a book, TV show, or movie to your friends, give an amount of time for everyone to finish it, and then discuss it together. You can do this via Skype or Google Hangouts, etc if you cannot meet in person. In addition to that, you can recommend different TV shows, books, or movies for your friends to watch and they can recommend things back to you so that you have something new to do at home. It is a fun way to talk about a show, book, or movie without spoiling anything for your friends. Furthermore, it helps you socialize when you are too sick to leave your house. It's something I really like to do because I love movies. I also love to read. I've had books recommended to me that are out of my comfort zone, that I would not have heard of or read without my group on Facebook, and surprisingly, I found I really liked that suggestion. It helps you explore new avenues of genera you might not have thought of. There are free online classes that you can take at some colleges. This would help you to make new friends without leaving your house. You can also increase your education at the same time! It would help to occupy your time so that you are not home alone, with temptations to be stressed or depressed. Colleges have free classes on a variety of topics, so pick one that you are really interested in. There are other places other than colleges that offer free classes, but you would have to look around for it. You can do anything you put your mind to. But, it would help to expand your circle of friends and you never know, some of the people in your online class might be in the same position you are. 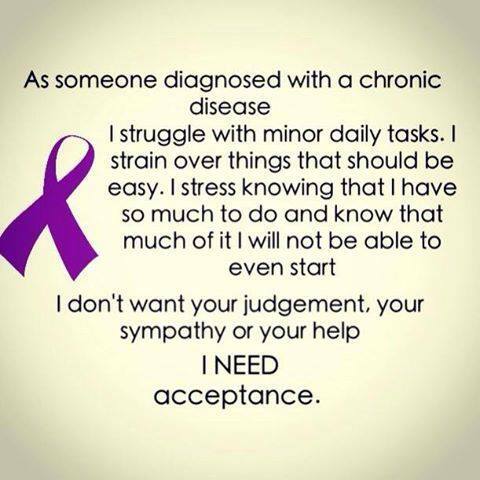 There are lots of support groups online now for invisible illnesses. However, you don't just have to join a support group for your illness - there are other groups based on similar interests, like crafts, for example. I would recommend joining a support group for your illness because it helps to have people who understand you, and you need a safe environment to vent in and ask questions. There are also all sorts of groups online for hobbies, and by joining those groups, you may learn new things about your hobby you did not know before. It could be a lot of fun! You would definitely meet new people in both kinds of groups and that will help you socialize if you are like me, and at home a lot. No one should be alone. In this day and age with social media and the Internet, no one should be alone at all. So, search whatever hobby you are interested in among the groups and see which groups fit you best. Do not forget that you can join more than one group. I'm sure there are many other things you can do to socialize with friends and make new friends, but this is a good list to get you started. 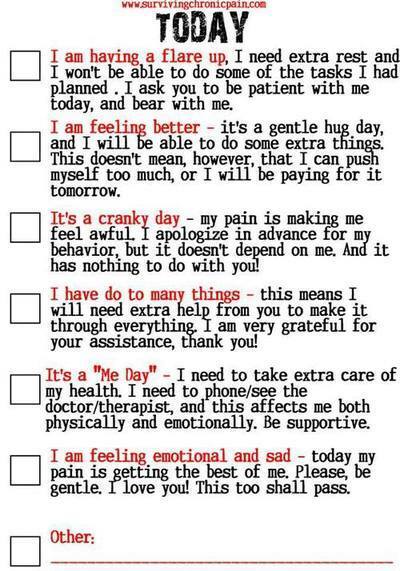 I have done all of the above and wanted to share it with everyone so that you do not feel alone. 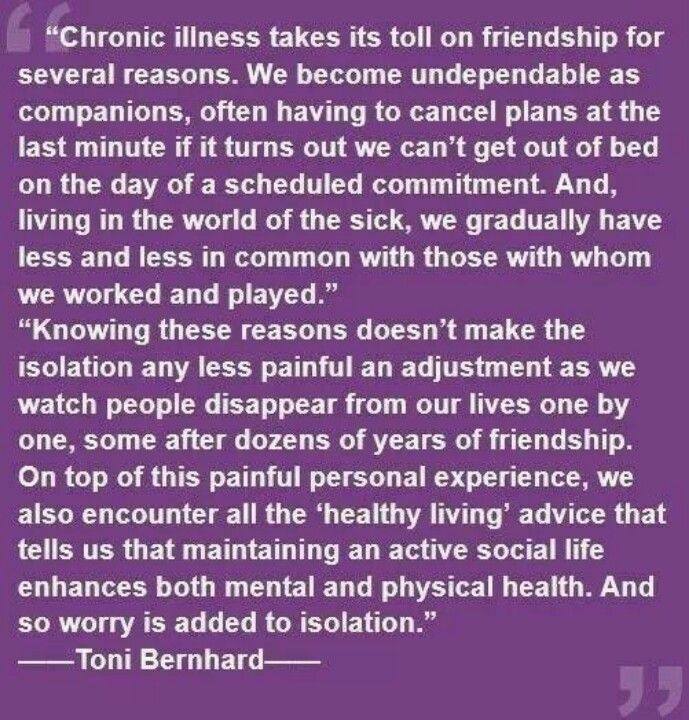 I know that invisible illnesses can be so isolating. It is very hard for me to leave the house because I vomit. I have wonderful friends who come over and spend time with me, and I skype my family, who live two hours from me, to catch up on the family and what is going on there. I hope this helps you. If you have any more suggestions to add to the list, feel free to comment. I will gladly keep adding to this list as I learn more things to do when you're stuck at home.